Health Risks Low For Cleanup Crews : Shots - Health News About 20,000 workers are toiling long hours to clean up all that oil in the Gulf of Mexico. One New Orleans hospital has seen 11 cleanup workers in the past few weeks with symptoms such as dizziness, headache and nausea. But the greatest risk is not chemicals, it's likely heat stress from people working long hours in temperatures hovering around 95 degrees. 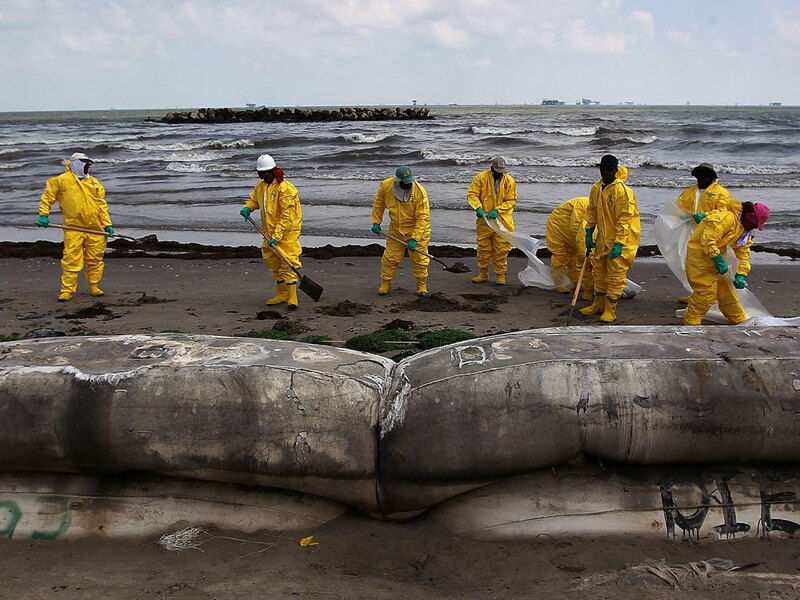 A BP cleanup crew removes oil from a beach on May 23 at Port Fourchon, La. About 20,000 workers are toiling long hours to clean up all that oil in the Gulf of Mexico. It's a dirty, exhausting job. But are these workers endangering their health by spending all that time around crude oil and chemical dispersants? Sometimes they are, says Damon Dietrich, an emergency room doctor at West Jefferson Medical Center, just south of New Orleans. The hospital has seen 11 cleanup workers in the past few weeks with symptoms such as dizziness, headache and nausea, Dietrich says. "We've got to believe that it's either the burning of the oil, working around the oil spill or the dispersants that are causing their symptoms," he says. Most cleanup workers, though, haven't had problems. And air quality measurements from around the gulf suggest that pollutant levels are actually quite low. So at the moment, the greatest health risk is probably not chemicals, says Joseph Hughes, Jr., from the National Institute of Environmental Health Sciences' training unit for workers with hazardous materials. It's heat stress from people working "incredible hours" in temperatures hovering around 95 degrees. Experience with the 1989 Exxon Valdez spill in Alaska may explain why oil isn't causing more health problems. Scientists realized that even though oil contains highly toxic chemicals like carcinogen benzene, they usually dissipate within a couple of days of being exposed to air and light. And it's reassuring that a federal study of 11,000 workers involved in the Exxon Valdez cleanup did not find many health problems. But things might be different in this spill because the gulf is so much warmer, and lacks the wind and wave patterns of Alaska, says Bob Emery of the University of Texas Health Science Center in Houston. Higher temperatures, he says, could release toxins that would otherwise stay locked inside of tarballs. Also, nearly a million gallons of chemical dispersant have been used to break up the oil in the Gulf -- far more than was used in Alaska.